When we talk about Andrew Carnegie, the robber baron, we pronounce his name CAR-neg-ie. Yes, that was the guy who had his steel workers doing 12 hours days/7 days a week. When you hear his name spoken on NPR radio, however, it’s Car-NEG-ie. That’s the guy who founded and funded libraries, museums, and so much more. Carnegie – however you pronounce it – felt a moral obligation to give away his fortune for societal benefit. Ah, good ol’ philanthropy – a fantastic builder of common good, even if the utilized fortune was questionably attained. John Rockefeller Sr. is the greatest philanthropist in the history of the world, not only because of the sheer volume of his giving (more than $1.5 billion during his and his son’s lifetimes – close to $20 billion in today’s dollars), but more so because he was the first mega-philanthropist wanting to get at the root causes of societal problems. As quoted by biographer Ron Chernow, Rockefeller explained his mature view of philanthropy: “Our guiding principle . . . to benefit as many people as possible. Instead of giving alms to beggars, if anything can be done to remove the causes which lead to the existence of beggars, then something deeper and broader and more worthwhile will have been accomplished” (Titan, Vintage, 1998, p. 314). The Rockefeller foundation has uplifted the common good by various accomplishments: eradicating hookworm in the southern US and in fifty-two countries across six continents, developing a vaccine for yellow fever and other diseases, supporting minority and higher education, establishing medical and social science research centers, among many others. Bill and Melinda Gates have followed in Rockefeller’s and Carnegie’s paths and readily share their enthusiasm for philanthropy’s continued upside. Bill and Melinda Gates, quite simply, are in Rockefeller’s category as philanthropists. They are committed to fighting inequity, and have joined with investor and philanthropist Warren Buffet to form the Giving Pledge, encouraging fellow super-wealthy to commit to give away more than half of their fortunes through philanthropy during their lifetimes or in their wills. Through their own foundation, established in 2000, the Gateses battle hunger, poverty, and disease and also uplift education. You might not know as much about Melinda as you do about her husband. A native of Dallas and 1982 valedictorian of Ursuline Catholic Academy, she has both an undergrad degree (in computer science) and an MBA from Duke University; she began to work for Microsoft in the late 1980s. 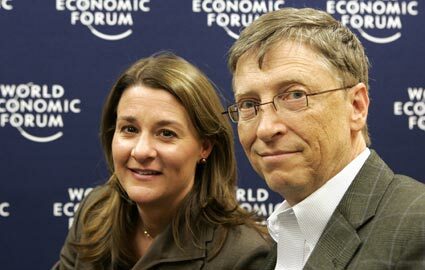 After dating for six years, Melinda French and Bill Gates married in 1994. They have three children; she is a practicing Roman Catholic and has her husband’s support in raising their children in the Catholic expression of the Christian faith. The Gates’ 2015 annual letter makes a bold claim: “The lives of people in poor countries will improve faster in the next 15 years than at any other time in history. And their lives will improve more than anyone else’s . . . These breakthroughs will be driven by innovation in technology — ranging from new vaccines and hardier crops to much cheaper smartphones and tablets — and by innovations that help deliver those things to more people.” Wow – that’s pretty ambitious. For the most part, I think they are right. The long-running industrial era with its call to work and accompanying rewards has lifted so many from the grips of poverty (including, for those reading this blog, most of our own ancestors). And that process continues today in poor countries – look what’s happened in China and India in the last twenty-five years, and most recently in Tanzania, Rwanda, and Cambodia. The improvements that can be made in underdeveloped countries are astounding and are enhanced by today’s technological possibilities. Have you heard of the term technological optimism? It refers to a type of thinking that expects the problems of the world – economic, social, political – to be solved, or at least, assuaged, by technological advances. Bill and Melinda Gates, unequivocally, are technological optimists. For the large majority of us in developed countries, living with the benefits of industrialization, technological advances are less advantageous. Being able to watch a movie on one’s phone – an example of technological advance – is not a life-or-death issue. In the developed world, we more so deal with something called the energy-complexity spiral (see Joseph Tainter and Tad Patzek’s excellent book, Drilling Down, Springer, 2012). The availability of incredibly cheap energy (coal and oil) has made possible – literally, fueled – the industrialized development of society. As we try to solve problems in the advanced world (how to play a movie on a hand-held device, or how to make a new anti-cancer drug less nausea-producing) more energy, knowledge, and money are typically required. Remember when the thermostat in your living room had a simple on-off switch and a dial temperature control? Now your “climate control device” houses a mini-computer and you often need to consult the manual, or call a technician, in order to manipulate it. Part of the energy-complexity spiral is that problems and solutions tend to get more complicated (and costly) as time marches forward. The Gates’ annual letter says we’ll need to figure a way “to develop energy sources that are cheaper, can deliver on demand, and emit zero carbon dioxide.” Agreed – but, unfortunately, we are a long way off. We’re still drilling and burning oil like never before and the waste sinks on this poor planet get more exhausted all the time. The temporary low price of oil – mid-2015 near a five-year low – doesn’t help the situation. At the very least, we need to utilize an additional tax on gasoline to restore a sense of value to this precious commodity. * And because we’ve not yet backed off of oil, we’re stalling on the technological advances that will help produce better energy sources for tomorrow. The main problem with an economy-produced fortune, like Rockefeller’s or Gates’, is that it necessarily comes imbued with technological optimism. I’m a supporter of technological advance, but I’m also wary of its allure and promises. Skyping on my phone is cool, but face-to-face relationships that create trust are the foundation of a good democratic society. Drought-resistant seeds in Africa, more cell phones for the women of Bangladesh, and widespread vaccine coverage for children in Nigeria is good . . . but we can’t duplicate developed world devices, machines, and technologies for the rest of the world based on how much fossil fuel we currently use. It would be a carbon emissions melt-down and waste sink nightmare. Perhaps we could also have some major philanthropic support to fund studies and projects that look at steady state economies, inclusive of how to slow down American consumerism while considering the disparate state of standards of living around the globe. Is there a current technology to remind us that less can be more? Philanthropy is good, but it’s not the highest good. If philanthropy is understood to be the highest good we can produce, it then becomes no more than a paternalism that perpetuates the status quo. Creating systems of economy that are thoroughly just – where people don’t get left behind or left out – is the highest good. Capitalism in the 21st century is very good, but it can be and it can do better. We are responsible for making it better for today and for tomorrow. At the end of the Gates Foundation letter, Bill and Melinda make an invitation to readers to join the movement by becoming “world citizens.” I’ve joined. The end of the letter calls for the “expanding of compassion” among world citizens. Part of that expansion, ironically, is using less – a mindset which absolutely cuts into grain of today’s conventional wisdom that more is better. How to get more out of less – that’s not only efficient, but also compassionate. * Proceeds of an additional energy tax could be used to fix crumbling American infrastructure and support development of better energy sources. The views expressed in this blog are reflective of my work in the 2014 book, Just a Little Bit More: The Culture of Excess and the Fate of the Common Good. Click here for Summary Version and Study Guide from the Blue Ocotillo Publishing website, ideal for book clubs and community of faith study groups. In this current day when congressional Republicans and Democrats don’t agree on much of anything, there is one thing that creates a rare kum bay ya moment of unity for the two groups: economic growth. Don’t get me wrong – healthy economic growth provides jobs, creates necessary goods, and keeps the majority of us fed, clothed, and sheltered. Healthy economic growth is a many-splendored thing! However, for reasons I will explain below, we tend to become fixated with economic growth to the point where we proclaim it our societal salvation: the elixir to ameliorate all social problems from unemployment to social program funding deficits. To the contrary, I propose that the unexamined pursuit of economic growth in a finite world only makes our problems worse and hinders us from seeking and implementing actual solutions. Let’s cut to the chase. As the Depression eventually gave way to post-World War II, vibrant economic growth in America lifted many out of poverty and pretax incomes between the richest and poorest Americans narrowed. Economic growth (annual GDP) hummed along at 4% and 5% yearly rates. The US government published the first national poverty rate – 22.4% – in 1959, a significant improvement over the poverty rate estimates of 40-60% during the Depression. One of the main factors contributing to this strong growth was cheap and plentiful oil. As US production of oil was not able to keep up with demand, reliance upon cheap and plentiful foreign oil increased in the 1960s. The OPEC oil embargo of 1973 changed all that. Economic growth decreased to 3% during the 1970s and ’80s, and for the fifteen years of the new century it has hovered around 2%. One of the main factors for the decrease of the growth rate is the increasing price of energy due to the difficult and costly process of extracting energy sources. Have you ever heard of the term EROEI? It’s an acronym for energy returns on energy invested. Back in the days of Rockefeller and the early American oil boom, EROEI was 100:1, meaning the energy equivalent of one barrel of oil input produced one-hundred barrels output. The area surrounding Titusville, Pennsylvania attracted oil drillers in the 1860s because of the ubiquity of oil springs – little creeks of oil! Those were, as they say, the good old days. Today EROEI for oil is about 15:1. Extracting petroleum from the bottom of the North Atlantic, for example, can be classified as an engineering miracle – albeit an expensive and extremely complex one. As the Keystone XL pipeline continues to be a point of contention in US Congress and American society, check if the sites from which you source information actually report on the EROEI of the Canadian tar sands. I’ve yet to hear a mainstream news organization mention EROEI. Some of the tar sands have a ratio as low as 3:2. Joseph Tainter and Tad Patzek, in their excellent treatise on our current energy dilemma, Drilling Down (Springer, 2012), tell us that to power a complex modern society a net energy ratio of at least 5:1 is required. Yes, the completion and implementation of the pipeline will create jobs – but at what cost? I’ve not even mentioned the accompanying pollution and strains on water supplies that the production of these energy sources entails, and the additional release of carbon into the atmosphere upon their eventual consumption and use . . .
To complicate matters, the Saudis are flooding the market with – just like the good old days – cheap oil. As I write this post in January 2015, gasoline prices in America are hitting long-time lows as the price of oil crashes the $50/barrel barrier for the first time since 2005. And, on cue, economic growth is up. Some are hoping (reports come out at the end of January) for a 5% growth rate – just like the good old days – for the fourth quarter of 2014. Will it last? Has the American economy made its long-awaited comeback to 1950s’ era growth? We’d be foolish to expect a return to what used to be. Cheap, high quality energy – coal powering the industrial era before oil became dominant at the turn of the 20th century – provides strong economic growth and is the essential foundation of the highly advanced society of which we are accustomed. A gallon of gasoline has the energy equivalent of four hundred person hours of work. Giddy up and then some! So, YES, economic growth is a good thing. BUT, the good and strong growth we’ve experienced has been based principally on a cheap energy source. The fossil fuels coal and petroleum, essentially millions of years of chemically stored sunlight, have made possible a 200-year run of high-phase energy gain. Social commentator Richard Hienberg says we’ve gotten accustomed to a “perpetual growth machine.” For those who think the next high-yield energy source – methane hydrate is currently being touted – will pick up the slack when fossil fuels run their inevitable course of completion, I ask: Is it not narcissistic and irresponsible to think we have to continue on the same trajectory of consumption we’ve been on for the past 200 years? Financial advisor and writer Paul Kedrosky wisely opines: “I want to believe in innovation and its possibilities, but I am more thoroughly convinced of entropy.” In other words, the unlimited growth machine can’t and won’t last forever. Australian economist Clive Hamilton calls our commitment to unlimited growth above all other things a fetish, “an object worshipped for its magical powers.” Unlimited growth is known by another name: cancer. The defining characteristic of a cancer cell is its inability to self-regulate. Healthy cells follow an established cycle of division, multiplication, and then, inevitably, death. Cancer cells are interested in only one thing: unlimited growth. Similarly, over-commitment to economic growth makes us susceptible to bubbles – the 1990s’ dot.com and the 2000s’ housing bubbles being the most recent examples. Economic bubbles are like cancer cells – they don’t know when to stop and they damage the common good. What I’d really like to hear from a politician – a president, no less – is talk about a steady state economy. In this day and age, an elected leader – Republican, Democrat, or independent – tempts political death if he or she were to speak common sense and encourage steady state economics. That’s why it’s left up to authors and bloggers like me to do it. And, in case you’re wondering, the EROEI of wind and solar energies are 20:1 and 13:2, respectively. My book, Just a Little Bit More: The Culture of Excess and the Fate of the Common Good, is available at http://www.blueocotillo.com and wherever books and ebooks are sold, including Amazon. I promised to keep you posted . . . and this one is worth the wait. Daniel Yergin’s The Quest: Energy, Security, and the Remaking of the Modern World (Penguin, 2011) covers the myriad angles of energy production and consumption – oil and gas, coal, hydro, nuclear, solar, wind, and biomass – and most of their related economic and political ramifications. Yergin’s previous effort, The Prize (Simon & Schuster, 1991), is an epic recounting of the oil industry from its conception to its modern-day manifestation. The Prize is one of the best books I’ve read; it’s simply a must read for anyone wanting to understand the workings of our modern energy-dependent world and its future direction. Perhaps The Prize was too good; the initial two sections of The Quest – essentially an update on the oil industry from where The Prize left off – were a bit slow. All the good oil industry narratives (Rockefeller, Gulbenkian, Pickens) were already covered in The Prize; an exception, however, is Venezuela and Hugo Chavez’s machinations at power via oil. This new story kept my interest and reminded me of Yergin’s ability to tell a good tale while simultaneously expounding history. Things pick up considerably in section three (and beyond) as Yergin switches gears and covers the energy industry outside of oil and gas. The topics of electricity generation, coal, carbon release and climate change, nuclear power, renewable energies, energy conservation and efficiency make The Quest more than a worthy read. It’s at these points that the book‘s expansive reach most impresses. Additionally, Yergin’s tendency to not cut corners in the telling of the tale gives the reader a sense of satisfaction, as the time investment (more than 300,000 words, 725 pages) is significant. Yergin took five years to write The Quest, and with the help of his research assistants, he consistently delivers. He answers the questions that occur to you as you think through the reading, and discover. Yergin deeply informs (as an example: US nuclear energy production has remained steady at 20% of total energy produced ever since the Three Mile Island disaster of 1979, despite the addition of no new reactors), and presents sensitive issues without too much hedging one way or the other. His treatment of carbon release (section four) is especially balanced and engaging, as he goes back to 19th century protagonists Tyndall and Arrhenius in order to tell the larger story of climate change. While I won’t rate The Quest as one of the best books I’ve read, I’ll classify it as outstanding in its scope and compelling in its telling of the energy sector’s complexity. There is no modern world without the exploitation of energy stores; being conversant with Yergin helps one to be plugged into that which powers all (or at least, most) things modern. My book, Just a Little Bit More: The Culture of Excess and the Fate of the Common Good, can be seen as a complex distillation of many books – Yergin’s The Prize being one – contributing their particular insights to the overall message. It is available at the Blue Ocotillo Publishing website. One of my best reads ever: Daniel Yergin’s The Prize: The Epic Quest for Oil, Money, and Power. I read it in 1993, two years after it was published. I happened to be in San Antonio for a two-week conference (Stephen Ministry training) – two weeks! – which left ambitious bibliophiles like me plenty of time to venture into unassigned reading. Having recently moved to Texas, I figured I needed to do some reading up on the oil and gas industry. The Prize covered it all: gasoline as a throwaway product in the days of kerosene; Rockefeller and Standard Oil; Ibn Saud and the rise of Saudi Arabia; Splindletop, Texas and wildcatting for oil; characters like Calouste Gulbenkian, the Armenian “Mr. Five Percent”; the Nobel brothers; and much, much more. At close to 800 pages and more than 400,000 words, The Prize is generally accepted as the oil and gas history bible. It was awarded the 1992 Pulitzer Prize in General Nonfiction. Twenty years after having written The Prize, Yergin continues the saga with The Quest: Energy, Security, and the Remaking of the Modern World (Penguin, 2011). Ambitious in its own right at more than 300,000 words, The Quest promises to be a vital read. I’m starting to plow through it now. (A welcome change from the last six months strictly reading books and blogs on the art of publishing your own book!) I’ll keep you updated on the read; I expect a few good blog posts to result from the read as it relates to the topics of egalitarianism, economic democracy, and common good. Daniel Yergin is widely recognized as a definitive voice on the economy, security, and politics of energy. Without question, he is an apologist for the oil and gas industry – that is not necessarily an indictment. As Yergin details, the oil and gas industry has decisively made the modern world as it is. The dilemma that confronts all those employed by the industry and all of us moderns dependent upon it: Is uninhibited economic growth – always dependent upon relatively cheap energy – only and ever the definitive way forward? The current boom of natural gas from the drilling of shale formations in the US (optimistically forecasted to last some twenty-five years) does create jobs and fuel economic growth. But unlike eras of previous booms, we now must soberly consider fossil fuel pollution and climate change, especially with the increasing demand for energy from India and China. Can we go forward as we’ve done before, or is it time for a shift in understanding, practice, and outlook? The oil and gas industry, of course, is mostly resistant to such a shift. Yergin, bullish on the future of oil and gas (and renewable sources), is in an interesting spot. His words, recorded for future generations in his bestsellers, will be re-examined in twenty-five years and fifty years and beyond . . . How will the future look back on the conceptions, formulations, and actions of our generation? If the pursuit of uninhibited economic growth continues to be first and foremost, our legacy and its potential for good is wasted – like the gasoline carelessly tossed into rivers during the days of kerosene.